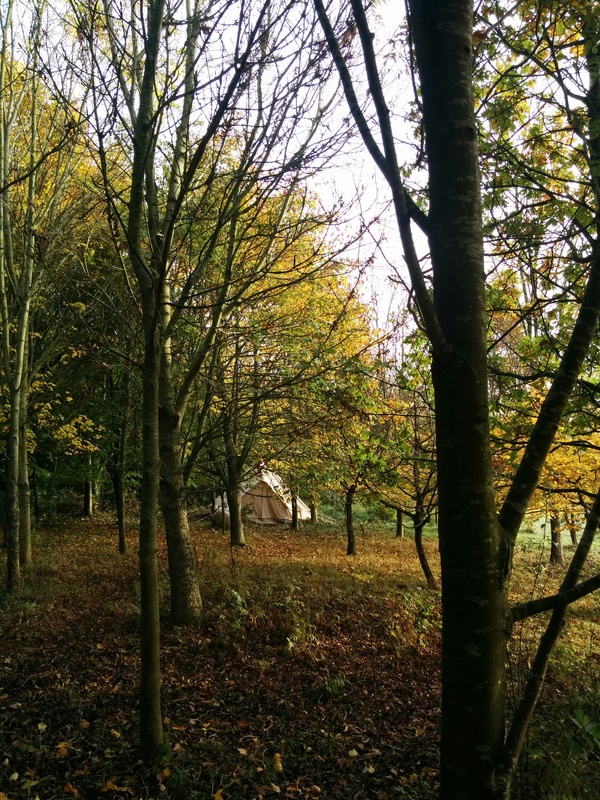 Let’s be honest, Autumn is not a great time of year to embark upon an experiment to live out in the open, in rural Somerset, for a month. On explaining my plan friends have chortled and parents have barely concealed their bemusement (perhaps because of their recent contribution toward the purchase of a new house). Fortunately Bristol is a non-judgemental place. While Londoners peer at their feet to see if my marbles might cause them an untimely fall, my Bristol friends have tended towards intrigue – perhaps even a hint of envy, amongst a select few. As I sit and write this, I am propped up in a makeshift bed beneath a bundle of blankets, wondering if my batteries will last me long enough to finish this post before I head somewhere to ‘plug back in’. A cup of tea steams by my side and I’m listening to the gentle pattering of rain against canvas, to leaves fluttering their way to earth, to the clicks, patterings and rustles of a wet autumnal wood. I’d expected cold and wet, but mostly I’ve been toasty and dry. I’d expected sleepless nights, Blair Witch style, wondering whether that snapping twig was the last sound I’d ever hear… but instead I’ve mostly been lulled into the deepest sleeps by the gentle noises of the wood. It’s not the first time I’ve chosen an odd living arrangement, last year I spent some time living in Silicon Valley in a van, and that was fun… mostly. On November the 11th, I will give my TEDx talk in Bristol, my adopted hometown – the city where I’ve felt most at home in my life after years of traveling. I wanted, as many do, to use the TEDx platform as a way to galvanise my thoughts. For many years, I’ve been sporadically blogging about simplicity, or at least what simplicity might look like if I was good at it. One of the reasons why I write is because it helps crystallise my views. It’s a mnemonic. It enables me to take a subject, force me to think on it and draw it to some kind of resolve, or at least help find chinks of clarity. I wanted to do the same with the talk. Although it couldn’t have come at a worse time in terms of my professional life, I decided to accept as I knew it would focus the mind and enable me to get a deeper understanding of what I actually think about these topics that I’ve been blabbering about for some time. Given how busy I already was – couldn’t I have mused on simplicity from the confines of Bristol’s many wonderful cafes? I could have. I should have, but I wanted to see what my ‘busy’ life would look like from the perspective of a tent in the woods each evening – what I would lose and what would gain from the experience. I wanted a mini-adventure, to explore the world here as part of my everyday, rather than donning a backpack and doing it a 14-hour flight away. I will leave the learnings and experiences to a subsequent post. I have a talk to write and no matter how many words I add, or take away, it’s a long way from perfectly expressing what I want to say. David’s post captures that frustration perfectly. Yet that is, of course, the process I signed up for. At some point I will have to draw a line under the best collection of words that I can use to express how I feel – as I do on my blog – and push it out there into the world, wondering if I could have done better with an extra week, an extra month, an extra laptop battery. 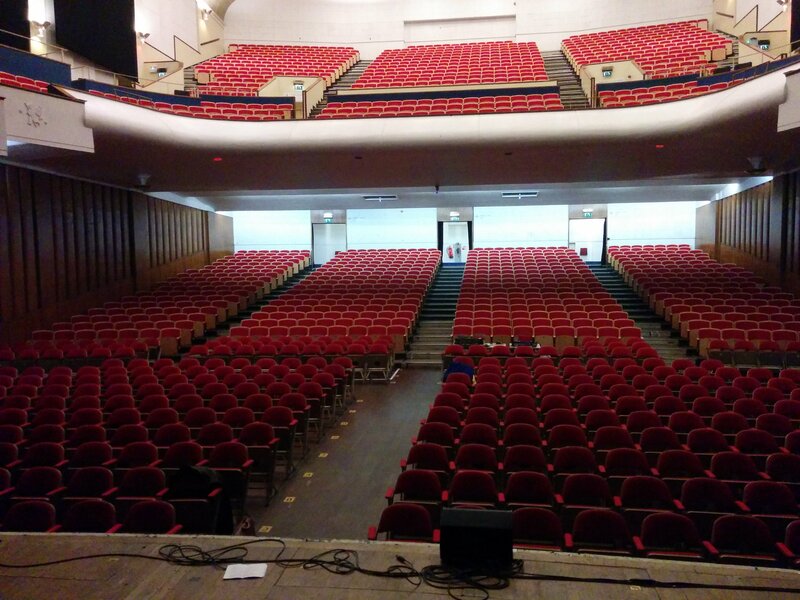 Here was my view during a quick check of the venue this morning… Gulp. Hey tom! After reading a bit about you, you’ve just jumped to the top of my list of people who inspire me. I’ll be there to watch your TEDX talk tomorrow (11th of Nov) and hopefully we get to meet. All the best!